Want to reduce your heating bills by making your existing fireplace more efficient? Try upgrading your existing stove or replacing it with a stove insert. See how we helped our customers! 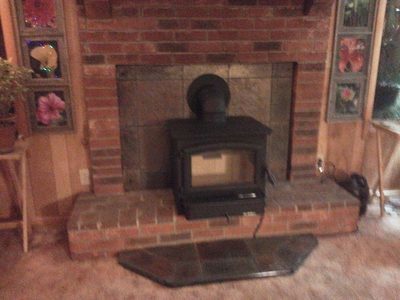 Our customers wanted to replace their old stove with a new Buck Stove. 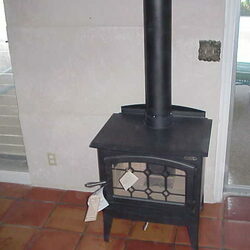 We replaced it with a Buck Stove Model 74, Non-Catalytic Wood Stove. This stove comes with a blower. 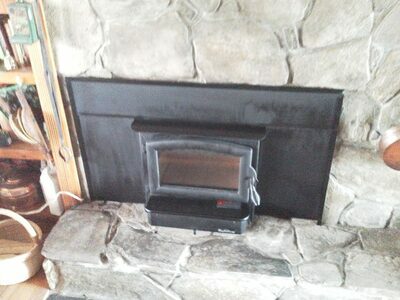 Our customer wanted to make her fireplace more efficient by replacing it with a stove. 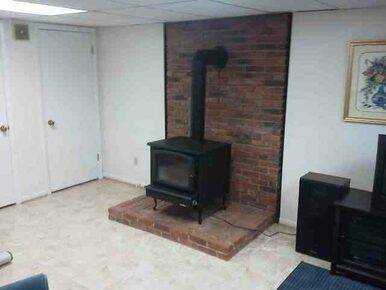 We refurbished this fireplace by installing a Buck Stove Model 21, Non-Catalytic Wood Stove. Model 21 with optional Queen Anne legs has a heating range of 800 to 1800 square feet. This model is an ideal choice for zone heating or small homes. We also installed an Asian Slate Tile Stove Board over the fireplace opening and a hearth extension. 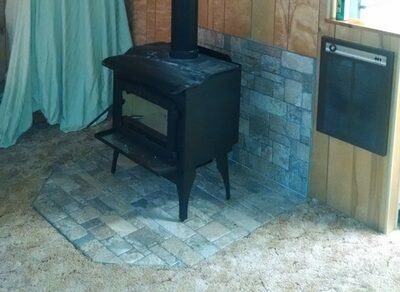 This Buck Stove Model 21, Non-Catalytic Wood Stove Insert was chosen by our customers to make their existing fireplace more efficient. Model 21 can be used as a fireplace insert with its optional insert kit or prefab insert kit with flashing, trim, and a blower. With a heating range of 800 to 1800 square feet, the Model 21 is an ideal choice for zone heating or small homes. Stove dimensions: 20-1/4″ H x 22″ W x 18-1/8″. 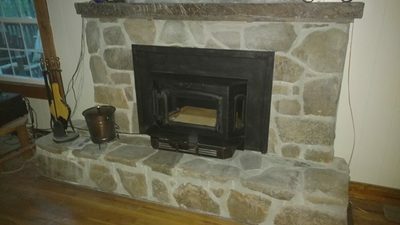 Our customer wanted to make his fireplace more efficient by replacing it with a stove insert. We installed Stoll High Valley Model 2500, Catalytic Wood Stove Insert, in "Old World" Style and "Burnished Bronze" Finish. This model is an efficient, aesthetically pleasing rustic-looking unit that will transform your heating needs and add appeal to any home, especially hear in the mountains. The unit comes standard with High Valley's unique air wash system to keep the view of the fire clear. High Valley Fireplace Inserts are now available with special Surround Kits that include a special design as well as added embellishments to the stove. Installation included cutting stone, installing a lintel, a 6-inch stainless steel seamless chimney reline, a new chase top cover, plate, chimney cap, and heat shield. Our customer purchased this stove elsewhere and the we installed it. If you have a stove that you need installing, just call us and we will be happy to install it for you. With over 35 years of experience, we guarantee the very best, quality installation!